Telluride has many claims to fame – as a mining boom town and an elite ski resort and as the home for festivals and celebrities ranging from Tom Cruise to Oprah Winfrey. But everything else takes a back seat to the mountain scenery – Telluride sits at 8,750 feet in elevation at the end of a box canyon ringed by 13,000-foot peaks. Look in any direction, and you see mountains rising steeply from the valley floor. The town also has played an outsized role in popular culture. Butch Cassidy robbed his first bank here in 1889, for $24,580. Nikola Tesla and George Westinghouse helped build the world’s first alternating-current power plant here in 1891. 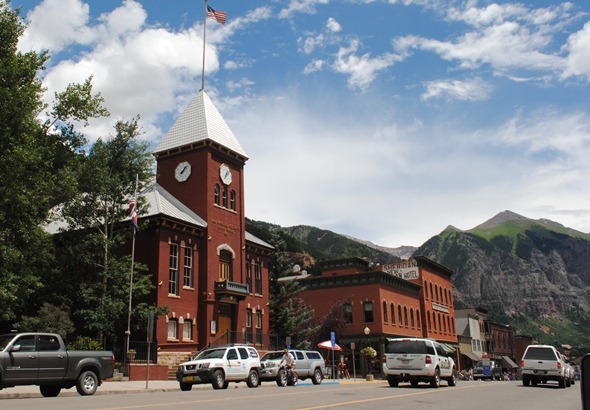 Thomas Pynchon features historic Telluride in his novel “Against the Day.” Glenn Frey mentions Telluride’s drug scene in his song “Smuggler’s Blues” from the TV show “Miami Vice” and The Nitty Gritty Dirt Band and Tim McGraw have written “Telluride” songs. Telluride, however, retains a certain charm because it has seen it all – a mining boom that gave the town nearly 2,446 residents and more millionaires per capita than New York City in 1900, a series of economic downturns that left it barely holding on with just 500 residents in 1920 and 1970, then another boom as an elite ski resort was built in the nearby mountains and the area emerged as second home for celebrities and millionaires. The town retains a distinctive charm with its 300 historic buildings, its 365-foot Bridal Veils waterfall visible from anywhere downtown, its “free box” downtown that turns one resident’s castoff into another’s treasure, its myth that the town’s name is a shortening of “To Hell You Ride,” and its ability to make fun of its notoriety as a popular site for summer festivals by staging a Nothing Festival each July that’s about nothing at all. Land area: 0.7 square miles. County: San Miguel (Telluride is county seat). Altitude: 8,750 feet above sea level.